Not to be confused with Mark Anthony. Marco Antonio Muñiz (born September 16, 1968), known professionally as Marc Anthony, is an American singer, actor, record producer and television producer. Anthony is also the top selling tropical salsa artist of all time. The two-time Grammy Award and six-time Latin Grammy Award winner has sold more than 12 million albums worldwide. He is best known for his Latin salsa numbers and ballads. Anthony has won numerous awards and his achievements have been honored through various recognitions. He was the recipient of the 2009 Congressional Hispanic Caucus Institute (CHCI) Chair's Award. He also received the "2009 CHCI Chair's Lifetime Achievement Award" on September 16, 2009. He holds the Guinness World Record for best-selling tropical/salsa artist and the most number-one albums on the Billboard Tropical Albums year-end charts. Marco Antonio Muñiz, known by his stage name Marc Anthony, was born in New York City to parents from Guayama, Puerto Rico. His mother Guillermina was a housewife, his father, Felipe Muñiz, a musician and hospital lunchroom worker. Anthony's parents named him after Mexican singer Marco Antonio Muñiz. Anthony grew up in East Harlem, also known as Spanish Harlem and El Barrio, and is the youngest of eight children. He was raised Roman Catholic. Muñiz began his career as a session vocalist for freestyle and underground New York house music acts. After changing his name to avoid confusion with his namesake, Anthony worked as a songwriter and backing vocalist for pop acts Menudo and the Latin Rascals. His first album was a freestyle music record, "Rebel," which debuted in 1988 on Bluedog Records. That same year he wrote and produced "Boy I've Been Told" for fellow freestyle artist Sa-Fire. Then in 1989, he sang backup vocals for Ann-Marie on the freestyle club hit, "With or Without You" produced by Little Louie Vega and Todd Terry. A year later in 1990, with Little Louie Vega and Todd Terry, Marc wrote a duet with Chrissy I-eece, called "You Should Know By Now." In 1992, still working with Todd Terry, he provided vocals for "Love Change," which is on the flip-side of a 12" vinyl released by Elan and The Powermachine titled "Here's Your Hat," production of Todd Terry. At the same time, he collaborated with music producer Little Louie Vega, who featured the singer on many freestyle-flavored club hits "Ride On The Rhythm" and the "When The Night Is Over" album, which featured the freestyle classic "Time." In 1992, Vega and Anthony opened for Latin bandleader Tito Puente at New York's Madison Square Garden. After 1992, he changed his style from freestyle to salsa and other Latin styles. Anthony was initially reluctant to become a salsa musician and declined an offer to make a salsa album when Ralph Mercado, president of RMM Records, asked him. Anthony was in a taxi when he heard Juan Gabriel's hit song, "Hasta Que Te Conocí," which influenced him to change his mind and ask Mercado if he could record it as a salsa tune. Inspired by the music of Tito Puente, Héctor Lavoe, Rubén Blades, and Juan Gabriel, Anthony released his Spanish-language debut, Otra Nota, in 1993. Anthony performed at the Radio y Musica Convention hosted by Alfredo Alonso. The album also included a cover of Bread's song, "Make It with You." Subsequent tours throughout the Americas, including an opening slot for Blades, established Anthony as one of the new stars in salsa. In 1994, he was featured in La India's album Dicen Que Soy, on the song "Vivir Lo Nuestro". His 1995 follow-up, Todo a su tiempo, won Anthony a Billboard award for Hot Tropical Artist of the Year. The album was also nominated for a Grammy with songs like "Te Conozco Bien," "Hasta Ayer," "Nadie Como Ella," "Se Me Sigue Olvidando," "Te Amare," and "Llegaste A Mi." The album has sold more than 800,000 copies and has become established as a gold record in the United States and in Puerto Rico. Anthony's next Spanish language album, Contra La Coriente, was followed by the television special Marc Anthony: The Concert from Madison Square Garden. It was broadcast on HBO on Valentine's Day in 2000. The special was nominated for the Music Special of the Year by TV Guide. The album's song "Y Hubo Alguien" became Anthony's first number-one single on the Billboard Hot Latin Tracks and the first by a salsa musician. The album became the first salsa album to enter the English language Billboard 200 chart. After an ongoing battle with RMM, he severed ties with Ralph Mercado and left the label in 1999. Otra Nota, Todo a Su Tiempo, and Contra La Corriente established him as the top-selling singer in the history of the genre, able to sell out Madison Square Garden and prestigious venues internationally. Anthony subsequently recorded the duet "No Me Ames" with Jennifer Lopez on her album On the 6, giving her an assist in her Spanish language crossover attempt. He also recorded a duet "I Want to Spend My Lifetime Loving You" with Tina Arena, written by James Horner for the latter's soundtrack for the 1998 swashbuckling movie The Mask of Zorro. In 1999, riding the crossover wave of Ricky Martin and Enrique Iglesias in the Anglophone market, Anthony, working with producers Walter Afanasieff, Cory Rooney, Dan Shea, and Rodney Jerkins, released an English-language, self-titled album with the US Top 5 single "I Need to Know", and the Spanish version, "Dímelo". His song "You Sang To Me" was featured in Runaway Bride. A dance version was remixed by Dutch producer Rene Van Verseveld. The album debuted at number eight on the Billboard album chart, and six weeks later went platinum; it eventually was certified triple platinum.The song "I Need To Know" earned a Grammy nomination for Best Male Pop Vocal Performance. Sample of the song "Tu Amor Me Hace Bien" from the album Valió la Pena. The song was produced by longtime collaborator Sergio George, who worked on most of Anthony's salsa albums. On July 11, 2006, Anthony released Sigo Siendo Yo, a Spanish greatest-hits album. On May 2010 he released Iconos, a tribute to old Latin songs by artists such as José Luis Perales, Juan Gabriel and José José. In 2012, he released a new song called "Cautivo De Este Amor." In the same year, Anthony was inducted into the Billboard Latin Music Hall of Fame. In December 2012, it was announced that Anthony was recording a salsa album alongside longtime producer Sergio George. Vivir Mi Vida, a Spanish adaptation of Khaled's song "C'est la vie", was released as the lead single on April 25, 2013. In July 2013, Anthony released 3.0, a salsa album including his song "Vivir Mi Vida". Since the release, the album has been certified Platinum. In addition to the new album, Anthony announced his Vivir Mi Vida World Tour and traveled across 15 countries on three continents. After the tour, Anthony announced a second world tour for his album 3.0, his Cambio de Piel Tour. After his Cambio de Piel Tour, Marc Anthony kicked off UNIDO2, his international tour with Carlos Vives. Marc Anthony is in constant demand for touring. After The Vivir Mi Vida world tour, one of PollStar's top selling tours of 2013, was extended to May 2014 by popular demand, and received a Premio Juventud for Super Tour of the Year. Gigant3S, his US and Latin American tour with Marco Antonio Solis and Chayanne, topped 2012's Billboard Hot Latin Tours charts. Anthony sang "God Bless America" at the 2013 Major League Baseball All-Star Game at Citi Field. In September 2016, part of his tour "Marc Anthony Live" included 5 dates at Radio City Music Hall. Of the five shows, three were sold out. Anthony played supporting roles in projects including 1995's Hackers, and 1996's Big Night and The Substitute. He appeared with Rubén Blades and Puerto Rican pop singer Ednita Nazario in Paul Simon's 1998 stage musical, The Capeman, which ran for 68 performances. He had a role in Martin Scorsese's 1999 drama Bringing Out the Dead, and in 2001, opposite Salma Hayek, was in the film In the Time of the Butterflies. In Man On Fire (2004), Anthony, opposite Denzel Washington, played a wealthy businessman who hires a former U.S. Marine to protect his daughter from kidnappers in Mexico City. In 2007, Anthony starred in El Cantante, a biographical drama about the life of salsa music legend Héctor Lavoe, who died in 1993 from AIDS complications. Anthony's then-wife, Jennifer Lopez, narrated the story and portrayed Lavoe's wife. The film, released in August 2007, received strong reviews. In 2010, Anthony guest-starred in two episodes of the TNT medical drama HawthoRNe as a detective and the title character's (Jada Pinkett Smith) love interest. He was later named the executive music producer of the show. Anthony worked with ex-wife Lopez and director-choreographer Jamie King in late 2011 on a Latin talent series created by Simon Fuller, called Q'Viva! The Chosen. It follows Lopez and Anthony as they travel across 21 countries to find new talent. In 2012, Anthony guest-mentored on Season 2 of The X Factor. Marc Anthony has sold over 12 million albums worldwide, receiving numerous gold and platinum certifications from the Recording Industry Association of America (RIAA) along the way. He has been recognized by New York magazine as one of the Ten Most Influential New Yorkers, was inaugurated into the Billboard Hall of Fame in 2012, and was given a Lifetime Achievement Award by the Congressional Hispanic Caucus Institute in Washington D.C. in September 2009. He has won a total of 29 Premio Lo Nuestro Latin Music awards, the most for any male artist, and has been honored with the ASCAP Founders Award. He's received twelve Billboard Latin Music Awards, three Billboard Awards, and a special recognition from the Univisión television network in the last 2 years. He received his first Grammy in 1998 for Best Latin Tropical Performance for Contra La Corriente, directed, arranged and produced by Ángel "Cucco" Peña, followed by the first-ever Latin Grammy Song of the Year award for Dímelo (I Need to Know) in 2000. With momentum from that hit single, Marc Anthony, his eponymous English-language album debut, went triple-platinum in the US, and helped usher in the Latin pop explosion of 1999-2000. In 2005 he received double best-album Grammys: Best Latin Pop Album for Amar Sin Mentiras, and Best Salsa Album for Valió la Pena. Marc Anthony has had 25 Billboard chart hits – most recently, Vivir Mi Vida and Flor Pálida, which have received more than over 680 million views and 270 million YouTube views respectively. In May 2015 he received his second Vevo PL certification for 100 million views of his video A Quien Quiero Mentirle. In 2013, Vivir Mi Vida, the first single from 3.0, spent 18 consecutive weeks at #1 on Billboard, making it the longest-running #1 single of all time. It received the Latin Grammy Award for Record of the Year. Anthony was honored as the Person of the Year by the Latin Recording Academy on November 16, 2016 for his musical contributions and philanthropic work. 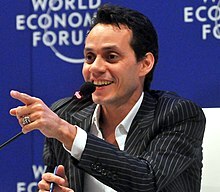 Marc Anthony and entrepreneur Henry Cárdenas launched the Maestro Cares Foundation in January 2012. In 2014, the foundation opened an orphanage in La Romana, Dominican Republic. In 2015, the foundation opened a youth home and school in Barranquilla, Colombia. In 2017, Anthony teamed-up with his ex-wife Jennifer Lopez and Alex Rodriguez to host One Voice: Somos Live!, a telethon supporting efforts to aid Puerto Rico's recovery in the aftermath of Hurricane Maria. Anthony became a minority owner of the Miami Dolphins in 2009. In 2011, he returned to television on the TNT series Hawthorne, toured the U.S., and launched his line of clothes and luxury accessories for Kohl's. Together with Jamie King and Jennifer López, he produced the 2012 TV series ¡Q' Viva! The Chosen, which aired simultaneously on Spanish and English television in the US and Latin America. In April 2015, Anthony announced the formation of the entertainment company Magnus Media. Anthony is a supporter of the Democratic Party, and performed "The Star-Spangled Banner" at the 2012 Democratic National Convention. In 2016, he and his ex-wife Jennifer Lopez co-hosted a concert in support of Hillary Clinton's presidential campaign. Anthony is a practicing Roman Catholic. Anthony performed "The Star-Spangled Banner" at the 2013 MLB All-Star Game. While he is an American citizen, born and raised in New York City of Puerto Rican descent, various posts on Twitter were made suggesting Anthony should not have been performing the song. In 1994, Anthony had a daughter, Arianna Muñiz, with then girlfriend Debbie Rosado. Also, while dating they adopted their son, Chase Muñiz. From 1996 to 1998, Anthony dated and became engaged to Dominican-American actress Claudette Lali. Anthony married former Miss Universe Dayanara Torres on May 9, 2000, in Las Vegas. They have two sons, Cristian Marcus Muñiz (born February 5, 2001) who Anthony named after the Mexican singer Cristian Castro, and Ryan Adrian Muñiz (born August 16, 2003). There were many problems in the marriage, and the couple separated in early 2002. They later reconciled and renewed their vows in a formal ceremony on December 7, 2002 at San Juan's Cathedral in Puerto Rico. The rocky marriage came to an end in October 2003 with Dayanara filing for divorce in January 2004. To help her recover from the divorce, Dayanara traded her engagement ring for a diamond-encrusted Cartier watch and wrote the book Married to Me: How Committing to Myself Led to Triumph After Divorce. Anthony married Jennifer Lopez in June 2004. Lopez gave birth to their children, twins Emme Maribel Muñiz and Maximilian David Muñiz, on February 22, 2008. People magazine paid $6 million for the first photos of the twins. In 2009, Anthony and Lopez purchased a stake in the Miami Dolphins. They joined several personalities in buying small stakes in the club, including Gloria and Emilio Estefan, Venus and Serena Williams, and Fergie. They bought two houses in Brookville, New York but Anthony and Lopez announced their separation in July 2011, with Anthony filing for divorce on April 9, 2012. Their divorce was finalized on June 16, 2014, with Lopez retaining primary physical custody of the two children. Anthony and model Shannon de Lima (born on 6 January 1989) married on November 11, 2014, in La Romana, Dominican Republic. In November 2016, Anthony and Shannon de Lima separated, and the following month announced they plan to divorce. On February 13, 2017, Anthony and Shannon de Lima finalized their divorce. 1993 Carlito's Way Cameo Appearance Sings "Parece Mentira"
^ "Marc Anthony Biography: Singer (1968–)". Biography.com (FYI / A&E Networks). Retrieved February 4, 2015. ^ a b "Marc Anthony Biography (1968-)". FilmReference.com. Retrieved February 4, 2015. ^ "Barclays Center New York, NY - Marc Anthony - tickets, information, reviews". Newyorkcitytheatre.com. February 16, 2013. Retrieved February 21, 2013. ^ Hunt, Christopher. "The Best Advice Marc Anthony Ever Got". Men's Health.com. Retrieved 30 April 2015. ^ Music Icon Marc Anthony to Receive 2009 CHCI Chair's Lifetime Achievement Award – Congressional Hispanic Caucus Institute Archived 2015-10-18 at the Wayback Machine. Chci.org (September 16, 2009). Retrieved October 1, 2011. ^ Latimer, Brian (February 9, 2016). "Marc Anthony Just Beat a Guinness World Record". NBC News. Retrieved February 9, 2016. ^ George Rush, Joanna Molloy, Celeste Katz (June 6, 2004). "J.Lo weds hubby No. 3 Marries Marc Anthony at her swank L.A. digs". Daily News. Archived from the original on October 13, 2011. Retrieved September 13, 2010. Both are of Puerto Rican descent and share the Catholic faith. ^ "Marc Anthony Biography." Bio.com. A&E Networks Television, n.d. Web. 06 Oct. 2014. <http://www.biography.com/people/marc-anthony-241193>. ^ Marc Anthony Biography Archived 2016-03-03 at the Wayback Machine. Sing365.com. Retrieved October 1, 2011. ^ Marc Anthony Iconos Nuevo Disco 2010 – Blog SonicoMusica.com para escuchar buena musica online. Sonicomusica.info (February 22, 1999). Retrieved October 1, 2011. ^ Cobo, Leila (April 26, 2012). "Billboard Latin Music Awards: Don Omar, Prince Royce Win Big". Billboard. Nielsen Business Media, Inc. Retrieved April 11, 2014. ^ Cantor-Navas, Judy (December 3, 2012). "Marc Anthony Recording Salsa Album for 2013". Billboard. Prometheus Global Media. Retrieved January 21, 2013. ^ "Marc Anthony to Launch First Single". Indiatimes. The Times of India Group. ^ "Marc Anthony Announces Tour of Latin America, US and Australia". ^ "Marc Anthony & Carlos Vives Announce Joint Tour". ^ Justino Aguila (June 6, 2011). "Marc Anthony Named Executive Music Producer of 'Hawthorne'". The Hollywood Reporter. Retrieved April 2, 2016. ^ Aaron Parsley (January 29, 2012). "Marc Anthony & Jennifer Lopez Come Together for ¡Q'Viva! The Chosen". Time Inc. Retrieved March 21, 2012. ^ "Marc Anthony - Artista tropical y salsa con record en Billboard". ^ Flores, Griselda (November 17, 2016). "Marc Anthony Honored by Colleagues During Person of the Year Ceremony: 'I Feel More Alive Than Ever'". Billboard. Retrieved November 18, 2016. ^ "New All-Male Orphanage". www.ninosdecristo.org. Retrieved 2016-04-12. ^ "Conoce Maba, el proyecto educativo que Marc Anthony apoya". El Comercio. Retrieved 2016-04-12. ^ Lewis, Randy (October 11, 2017). "Jennifer Lopez, Marc Anthony anchor star-studded 'One Voice: Somos Live!' telethon for disaster relief". www.latimes.com. The Los Angeles Times. Retrieved October 12, 2017. ^ "Singer Marc Anthony buys stake in Dolphins". ESPN.com. Retrieved 2016-04-12. ^ "Marc Anthony Officially Launches Kohl's Clothing Line, Kicks off Tour Friday". Billboard. Retrieved 2016-04-12. ^ "Marc Anthony Wants to Empower Latin Music Artists (and Athletes) With His Magnus Media: It 'Was Born Out of Frustration'". Billboard. Retrieved 2016-04-12. ^ "Marc Anthony Goes Mogul, Launches His Own Entertainment Company Magnus Media". Billboard. Retrieved 2016-04-12. ^ "Marc Anthony sings the national anthem". Politico. September 6, 2012. ^ Bakkila, Blake (October 30, 2016). "Jennifer Lopez and Marc Anthony Join Up in Miami for a Hillary Clinton Concert". www.people.com. People Magazine. Retrieved 18 August 2018. ^ "En Exclusiva: Así fue la boda de Marc Anthony y Shannon de Lima". Univision (in Spanish). November 12, 2014. Retrieved December 15, 2015. ...también que aunque Marc ya estuvo casado por la religión católica, el padre Juan Santana, bendijo la unión de esta pareja y que, al final del enlace, se abrieron las puertas de una jaula de la cual salieron volando mariposas doradas. ^ Vanesa G. Toca (January 8, 2007). "Cienciología, la religión de los famosos". El Universal (in Spanish). Retrieved December 15, 2015. Actualmente se rumora que JLo tiene problemas con su esposo, Marc Anthony, debido a que ella incursionó en esta práctica, mientras que él debido a que ella incursionó en esta práctica, mientras que él es católico de corazón y no comparte el cambio de religión. ^ "Foul Ball: Hate Speech, Twitter & Baseball". Retrieved July 24, 2013. ^ "Marc Anthony Biography Singer (1968–)". The Biography Channel (A+E Networks). Retrieved November 5, 2014. ^ "Marc Anthony's Love Life In 5 Clicks". Latina. Retrieved November 11, 2014. ^ "A Look at the Many Women in Marc Anthony's Life". PopSugar. Retrieved July 7, 2017. ^ "Marc Anthony ya es papá". Terra Networks (in Spanish). Telefónica. April 9, 2007. Retrieved January 4, 2014. ^ Stephen M. Silverman (June 8, 2004). "Marc Anthony Silent About Lopez Wedding". People. Retrieved January 13, 2007. ^ "Jennifer Lopez and Marc Anthony Split". People. July 15, 2011. Retrieved November 5, 2014. ^ "Introducing Max David and Emme Maribel Muñiz!". Celebritybabies.com. Retrieved March 21, 2008. ^ EXCLUSIVE: Jennifer Lopez & Marc Anthony Welcome Twins!– Jennifer Lopez and Marc Anthony. People.com (February 22, 2008). Retrieved October 1, 2011. ^ Brian Orloff (July 21, 2009). "Marc Anthony Buys Stake in Miami Dolphins". People. Retrieved July 20, 2011. ^ Chloe Melas (2011-07-19). "Jennifer Lopez & Marc Anthony Own $5.75 Million Worth Of Property In New York: Who Will Get It?". HollywoodLife.com. Retrieved 2014-09-05. ^ Dahvi Shira (April 11, 2012). "Marc Anthony Files for Divorce from Jennifer Lopez". People. Retrieved April 11, 2012. ^ "En medio de su divorcio con Marc Anthony, Shannon de Lima abre su corazón el día de su cumpleaños". 6 January 2017. ^ "Shannon de Lima Reflects on Her 28th Birthday Following Marc Anthony Split". ^ Tara Fowler (November 11, 2014). "Marc Anthony Marries Shannon de Lima". People. Retrieved April 2, 2016. ^ "Marc Anthony and Shannon De Lima Separate After Two Years of Marriage". E! News. Archived from the original on January 30, 2017. Retrieved 2016-11-19. ^ Latimer, Brian (December 19, 2016). "Singer Marc Anthony, Model Shannon de Lima Announce Divorce". NBC News. Archived from the original on December 20, 2016. Retrieved December 20, 2016. CS1 maint: BOT: original-url status unknown (link) Additional on December 20, 2016. ^ "Marc Anthony, Shannon De Lima Split: Couple Officially Divorced Right Before Valentine's Day". LatinTimes.com. Archived from the original on February 15, 2017. Retrieved 2017-02-14. Wikimedia Commons has media related to Marc Anthony.